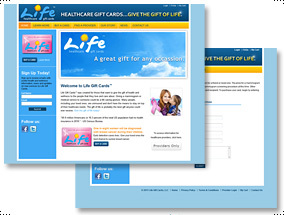 Taking the site concepts provided by the companies brand design firm, Laurie Anderson Design developed a full ecommerce solution with administration utilities to manage gift card provider data. Development efforts integrate with the offline sales and marketing efforts to provide a unified brand for this new/innovative product line. Search Engine Optimization is ongoing.